This study aims to describe the ultrastructure of coiled musculature fibers component of Gyrodactylus gasterostei and its role in this parasite transmission. The present work employs transmission electron microscopy to analyze G. gasterostei musculature, revealing the presence of myosin and actin bands in the underlying epithelium, typical arrangement of the skeletal muscle. This study unravels for the first time the existence of a coil muscle component in which it seems to be responsible for the remarkable flexibility of the musculature of Gyrodactylus and the efficiency of its transmission method to reach a nearby fish host. The elasticity of the musculature described in this study may be comparable with the other specialized elastic musculature within the animal kingdom (i.e., lizards tongue). The clarification of the basic biology of these monogenean parasites and its musculature biochemical systems hold the promise of possible novel muscle targets for a new generation of antiparasitic drugs. Gyrodactylids are skin parasites of freshwater fish. These monogenean flukes have a direct life cycle allowing rapid population growth on their host and conferring an ability to transfer to a new host during their life cycle. Pathogenic species of monogenean parasite belonging to the genus Gyrodactylus have had significant economic impacts on populations of wild fish species, such as the situation reported in Norway caused by Gyrodactylus salaris, causing an economic loss to the salmon industry between 200 and 250 million NKR-Norwegian krone-(~£ 27,634,600)., As parasites, gyrodactylids are forced to employ a range of transmission strategies to successfully reach their target, a new fish. Since Gyrodactylus has no larvae transmission stage in its life cycle, movement between hosts has to be granted by the full-growth adult that employs structural features to interpret both host and ambient environments. During this process of transmission or colonization, gyrodactylids appear to display and adapt to the behavior of the hosts using a wide range of behaviors in their transmission. One of the first descriptions of a gyrodactylid from dead hosts was detailed by Cable et al. These latter authors described the method by which Gyrodactylus turnbulli Harris, 1986 and its hosts, guppies Poecilia reticulata (Peters), come into close contact. After death, guppies float at the water's surface, its burden of G. turnbulli parasites move off these fish into the water film, hanging motionless with the haptor held by surface tension. Since guppies are surface feeders, detached parasites in the water film are using this host's behavior to increase the likelihood of contacting a new host. However, the majority of gyrodactylid species, if they are dislodged from the host's skin host, they sink until they reach a solid surface. Another interesting case of gyrodactylid behavior was reported by El-Naggar et al. These authors suggested that Gyrodactylus rysavyi Ergens, 1973 was capable of directional swimming by flexing its body, this involving ~4–8/s looping contractions in any direction. This motility was suggested to be an exceptionally efficient infection mechanism with respect to the Nile catfish, Clarias gariepinus (Burchell) host. By comparison, these authors reported that the closely related Macrogyrodactylus congolensis (Prudhoe, 1957) Yamaguti 1963 and Macrogyrodactylus clarii Gusev 1961 do not possess the ability to swim, even though they parasitize the same Nile catfish host. Behavioral flexibility in gyrodactylids may be important in the transmission process. Transmission from a dead host appears to be more efficient than from living ones concluded that parasites that remained on a dead host survived and maintained their infectivity for longer periods than detached worms. Gyrodactylus species usually have preferred sites on their host which, depending on the transmission strategy they use, facilitate their transmission to new host. Gyrodactylids disperse effectively using a variety of mechanisms, but the most common is most likely through contact between living hosts. The transmission could be by direct host contact, through dead fish (scavenging or food items); transmission also occurs by contact with dead hosts, parasites attached to the substratum and worms drifting in the water column.,,,, In benthic species, such as the 3-spine stickleback, transmission via the substrate is noticeable and can be one of the most important routes of transmission. This transfer may be facilitated by the response of mechanoreceptors present on the tegument, detecting aquatic turbulence by a fish nearby. Research on monogeneans, particularly Gyrodactylus, has been important for understanding some of the basic interactions between hosts and their parasites this noticeable fact was observed during previous research,, these subjective observations suggest that maybe exits a morphological similitude with other animals. The development of this study was of interest because of the widespread elongation body of Gyrodactylus projection musculature system (i.e., chameleon's tongue). However, no previous study on the description of the ultrastructure musculature system or the fine structure and function of inner fibers complex of the myosin and actin bands in Gyrodactylus, unfortunately, remains unknown. Our research attempts to identify the elastic fibers structure for which previous works within invertebrates and give a more detailed account of the function of these fiber bands and its implications for muscle elasticity-contraction in gyrodactylids, especially its role during gyrodactylid transmission to new host. It is also exciting to know the variation in the actin and myosin share which could be correlated with the function of G. gasterostei. In this study, we hypothesized the existence of a coil or elastic muscle component in the body of G. gasterostei. The narrow focus of this study on invertebrate muscle composition, especially the ultrastructure has not been explored previously of a broader description of possible ways, in which fiber proteins may control muscle elasticity and its possible role in parasite transmission. Therefore, the aim of this study is to describe the ultrastructure of the musculature fibers of G. gasterostei and its role in the transmission process. 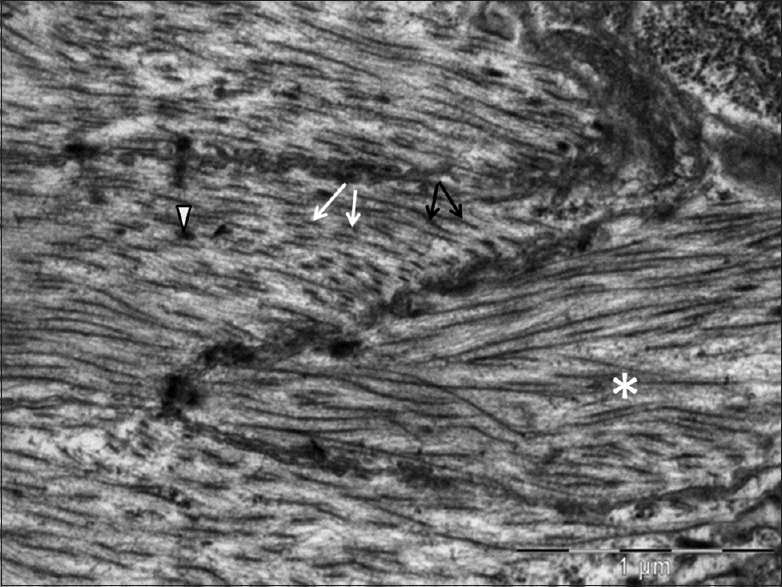 Transmission electron microscopy (TEM) was employed to localize the typical arrangement of skeletal muscle with, myosin and actin bands, in the underlying epithelium of G. gasterostei. This is the first attempt to illustrate the role of coil muscle as a possible transmission factor in this model fish parasite. A G. gasterostei/Gasterosteus aculeatus L. stickleback model was used [Figure 1]. Fish used for the study was collected and euthanized according to the methodology previously described., Individual sticklebacks were euthanized with an admixture of water and an overdose (0.01/L−1) of anesthetic 2-phenoxyethanol (Merck, Germany) and placed in individual Petri dish More Detailses containing filtered (0.45 μm Minisart Sartorius Stedim, Biotech) water taken from the same source. Worms detaching naturally from the host tissue were then used for the analysis [Figure 2]. Around 100 worms were carefully removed with a 200 μl pipette and placed individually into 3 cm Petri dishes containing clean water for further microscopy analysis. In this work, the identification of G. gasterostei specimen was based on hook morphology, particularly that of the marginal hook sickle. All experiments followed the Home Office, UK Animals (scientific procedures) act 1986 scientific procedures on living animals Licence/ppl no. 60/4088, 60/4715. 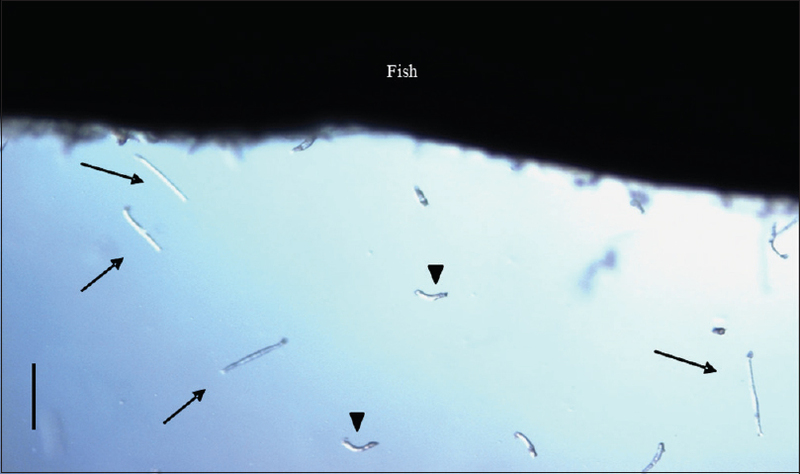 This study describes aspects of the ultrastructure function of the muscle G. gasterostei to its fish host, including the role of migrating worms. Photographic evidence of actin-myosin in the muscle, confirming the presence of these components. 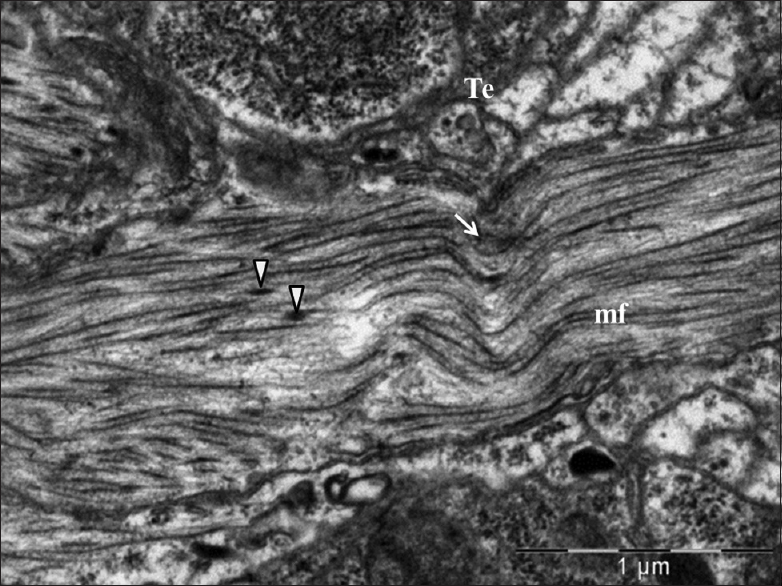 To determine the type of sub-tegument muscle components, TEM revealed a well-organized sub-tegumental musculature with several layers of fibers close to the tegument, consistently actin-myosin characteristics. These fibers run perpendicular to the longitudinal fibers and run parallel to the body of the parasite [Figure 3]. In some zones, an intermediate layer of paired longitudinal muscle fibers is observed [Figure 4]. This study describes aspects of the ultrastructure of the muscle fibers and the transmission of G. gasterostei to its G. aculeatus host, including the role and presence of myosin and actin bands in the parasite musculature. This study is set out to develop a better understanding of the behavioral research linked with the ultrastructure of the muscle involved in the transmission of Gyrodactylus sp. and exploratory microscopy techniques. The study of gyrodactylids which includes parasitology is vital to understand the biology of these monogeneans, without continuing research into those parasites and pathogens which are known to infect economical farmed species then the welfare of fish stocks cannot be guaranteed. There is, however, a lack of basic understanding of the composition of the musculature and its relation with the mechanisms of transmission, host-finding behavior, and of the cues prompting dispersal and host seeking in important monogenean groups such as gyrodactylids which infect a wide range of aquaculture species, which if untreated can cause significant mortalities in hatcheries and economic losses. Our study shows that in G. gasterostei musculature is assembled into striated muscle-like filaments in a sub-tegumental muscle construction. Striated muscles in the invertebrates may have evolved using the same basic building blocks, but in different organizations according to Sulbarán et al., who studied the musculature on flatworms Schistosoma sp., it appears likely that myosin and its assembly into side-polar filaments may be a specialization to the smooth muscles of vertebrates. The latest author's findings were challenged as they described as: “the paradigm (based on studies of vertebrates) that smooth and striated muscles have distinctly different components.” These results underline that classification of muscle based simply on the presence or absence of striations only partially reflects its diversity in primitive invertebrate organisms which appear to have evolved using similar myosin and actin components, but different Z-line constituents as these authors concluded. Other authors have described the presence of striated muscle of other invertebrates, that is, planarians and cnidarians, suggesting that the same structural muscle source may relate in other species. Great advances were elaborated studying the invertebrate group by Royuela et al., their studies included: “the myofilament length is inversely related to the contraction speed, which was higher in the striated muscles than in the obliquely striated muscles.” In vertebrates, the smooth muscle seems to be less rapid than the striated muscle because their myofilaments are longer. In smooth muscles, the presence of apparently unordered electron-dense bodies instead of ordered Z-lines and the absence of true sarcomeres permit a certain overlapping of thin filaments increasing the range of shortening. The latest results are consistent with that of the results found in the present research in monogenean specifically Gyrodactylus. Since early studies it was underline the fundamental importance concerning the knowledge based on the use of invertebrate muscles, to described the diversity of invertebrates muscles and their classified contraction was defined taking into account the excitation-contraction combination sequence. Recently, in the study elaborated by Hooper and Thuma, this research highlighted the presence of muscle-like cells in the Radiata group, implying that: “the first Bilaterian had a complete, or near-complete, complement of present-day muscle proteins.” These results concluded that the diversity of invertebrate muscle proteins and genes could resolve phylogenetic relationships and coevolution. This research without a doubt stresses the importance in the study of musculature and function in the vast invertebrate group. The invertebrate elastic proteins have some similarities in structure according to Royuela et al. and Bullard et al., In the work presented by Royuela et al., they identified that the muscle range of shortening is related to the distance that thin filaments can go over when they are displaced by thick filaments and the contraction strength is related to the number of actin-myosin in the fiber. A detailed, ultrastructure examination of the muscle component may improve current understanding of Gyrodactylus species. This musculature features may constitute a projection system favoring to reach a nearby fish host in gyrodactylids. Transmission strategies have been suggested by Harris et al. ; (1) via contact with live hosts, (2) via dead hosts, (3) by detached parasites drifting in the water column, and (4) by parasites attached to the substrate. This transmission potential, coupled with their high fecundity, allows gyrodactylids to rapidly colonize new river systems. Although these transmission routes, sensilla distribution, and hook attachment have been studied, ultrastructure of mechano, chemio and photoreceptors have been studied extensively,, and the ultrastructure and location of stored lipids in gyrodactylids. In the present study, we provide photographic data concerning the muscle properties structures that are found on the tegument and in the sub-tegumental zone of G. gasterostei that infected 3-spine sticklebacks. This investigation complements preceding other work on gyrodactylids and offers additional information on tegument internal structures. It may be likely to mention that certain gyrodactylids attached on the substrate on benthic fish host might behave in the same way. However, Olstad et al. described that detached G. salaris uses a strategy whereby it sits stationary on the substrate at an angle waiting for a potential host and only making occasional circular exploratory movements. This observation was also described on G. gasterostei by Grano-Maldonado during that study; it is clear that G. gasterostei on 3-spine sticklebacks respond to elongate his body, that is, in order to reach a new host or to move freely on the surface of the fish [Figure 1]b. Despite the comprehensive descriptions of monogeneans describing the neuromusculature of M. clarii using confocal microscopy, about the muscle cues that elicit or enable body's elongation to attach to a new fish host, these authors undertook the first intensive investigation regarding the functionality of monogenean including neuromusculature a detailed description of their structure. However, the muscle cues that elicit or enable elongate the body to attach to a new target host is at its infancy. There is currently a lack of basic understanding of the muscular mechanisms or how the morphological muscular specialization in gyrodactylids and host seeking from direct fish-to-fish encounter or free-living dispersal. It is evident that this morphological muscle specialization is tuned to functional advantage in gyrodactylids. However, the full extent of the muscular capabilities of the parasite is unknown. The ultrastructure and function of the associated musculature in gyrodactylids may be associated with some resemblances in the musculature of the lizard's tongue giving the “elastic” properties to extend their body. Clarification of the basic biology of the monogenenan and its musculature systems, such as proteins and peptides structure, could bring new insights for the identification of novel targets for antiparasitic drugs against gyrodactylids warrant further extensive research. This may be the case of antagonist compounds that mimic or block the natural transmitter (e.g., on muscle or nerve). Consequently, the focus of research is moving toward finding alternative methods to control parasites, which may target muscle system. This requires an increased understanding of gyrodactylid biology and behavior. The economic cost of any new potential treatments must also be considered. This study suggests for the first time that certain actin-myosin bands presented on the muscle of gyrodactylids conferring elasticity to the muscle described, may serve as key transmission factor. A feasible observable fact avoiding comparison between an invertebrate (monogenenan) and the specialized tongue-muscle of lizard species is the retractile musculature features present in both species. To conclude, we have shown that the presence of actin-myosin striated muscles in Gyrodactylus is very likely to have a similar contractile machinery. Our work showed that the component integral to muscle function in gyrodactylids may have a transmission function. In the present study, results showed that the properties of the elastic ultrastructure and function of the gyrodactylids musculature are a key factor on the Gyrodactylus-host transmission systems. Further research with supportive electrophysiology, immunohistochemical studies using antibodies raised against actin-myosin may also prove to be useful and the measurement of tension in isolated myofibrils may give a direct estimate of elasticity of the muscle fibers should be considered. Future studies, in conjunction with confocal scanning laser microscopy, phalloidin fluorescence technique, and cytochemistry, could verify or disprove this hypothesis. We would like to thank Dr. Antonio Matos-Head of the Electron Microscopy Center, CiiEM-Portugal, for his comments to improve this research, Linton Brown for assistance with the use of TEM, Dr. Zackary Sidney Marshall for providing editorial comments. Part of this article is derived from a PhD's thesis. I thank Andy Shinn and James Bron for mentorship. This study was supported by a Department of the Environment, Food and Rural Affairs (Defra) and an Overseas Research Students Awards Scheme UK and Consejo Nacional Ciencia y Tecnología, Mexico CONACyT (research fellow no. 171032). Special thanks to the anonymous reviewers for their comments to improve this article. Harris P. Interactions between reproduction and population biology in gyrodactylid monogeneans a review. French Bulletin of Fisheries and Aquaculture 1993;1:47-65. Winger AC. Artic Charr (Salvelinus alpinus L.) An Adequate Host to Gyrodactylus salaris (Monogenea). PhD Thesis; 2009. Bakke TA, Harris PD, Cable J. Host specificity dynamics: Observations on gyrodactylid monogeneans. Int J Parasitol 2002;32:281-308. El-Naggar MM, El-Naggar AM, Kearn GC. Swimming in Gyrodactylus rysavyi (Monogenea: Gyrodactylidae) from the Nile catfish Clarias gariepinus. Acta Parasitol 2004;49:102-7. Harris PD, Jansen PA, Bakke TA. The population age structure and reproductive biology of Gyrodactylus salaris malmberg (Monogenea). Parasitology 1994;108 (Pt 2):167-73. Herrel A, Deban SM, Schaerlaeken V, Timmermans JP, Adriaens D. Are morphological specializations of the hyolingual system in chameleons and salamanders tuned to demands on performance? Physiol Biochem Zool 2009;82:29-39. Grano-Maldonado MI. Ultrastructure of the external sensory apparatus of Gyrodactylus gasterostei gläser, 1974. Microsc Res Tech 2014;77:740-7. Grano-Maldonado MI. The Biological and Behavioural Basis of Host Selection in the Transmission of Gyrodactylus (Monogenea). PhD Thesis Stirling University; 2011. p. 228. Cable J, Harris PD, Tinsley RC. Ultrastructural adaptations for viviparity in the female reproductive system of gyrodactylid monogeneans. Tissue Cell 1996;28:515-26. Kritsky DC, Kruidenier FJ. Fine structure and development of the body wall in the monogenean, Gyrodactylus eucaliae Ikezaki and Hoffman, 1957. Proc Helminthol Soc Wash 1976;43:47-58. El-Naggar MM. Scanning electron microscope observations on the head lobes and haptor of the monogenean Macrogyrodactylus clarii Gussev, 1961. J Egypt Ger Soc Zool 1993;10:143-55. El-Naggar MM, Arafa SZ, El-Abbassy SA, Stewart MT, Halton DW. Neuromusculature of Macrogyrodactylus clarii, a monogenean gill parasite of the Nile catfish Clarias gariepinus in Egypt. Parasitol Res 2004;94:163-75. El-Naggar MM, Arafa SZ, El-Abbassy SA, Stewart MT, Halton DW. Neuromusculature of macrogyrodactylus congolensis, a monogenean skin parasite of the Nile catfish Clarias gariepinus. Parasitol Res 2007;100:265-79. Hoyle G. Interpreting muscle function in invertebrates. Pflugers Arch Gesamte Physiol Menschen Tiere 1966;291:12-27. Sulbarán G, Alamo L, Pinto A, Márquez G, Méndez F, Padrón R, et al. An invertebrate smooth muscle with striated muscle myosin filaments. Proc Natl Acad Sci U S A 2015;112:E5660-8. Ogawa K, Kobayashi C, Hayashi T, Orii H, Watanabe K, Agata K, et al. Planarian fibroblast growth factor receptor homologs expressed in stem cells and cephalic ganglions. Dev Growth Differ 2002;44:191-204. Steinmetz PR, Kraus JE, Larroux C, Hammel JU, Amon-Hassenzahl A, Houliston E, et al. Independent evolution of striated muscles in cnidarians and bilaterians. Nature 2012;487:231-4. Royuela M, Fraile B, Arenas MI, Paniagua R. Characterization of several invertebrate muscle cell types: A comparison with vertebrate muscles. Microsc Res Tech 2000;48:107-15. Hooper SL, Thuma JB. Invertebrate muscles: Muscle specific genes and proteins. Physiol Rev 2005;85:1001-60. Bullard B, Linke WA, Leonard K. Section: Elastic invertebrate muscle proteins; varieties of elastic protein in invertebrate muscles. J Muscle Res Cell Motil 2002;23:435. Shinn AP, Gibson DI, Sommerville C. Argentophilic structures as a diagnostic criterion for the discrimination of species of the genus Gyrodactylus von Nordmann (Monogenea). Syst Parasitol 1997;37:47-57. Grano-Maldonado MI. Ultrastructure study of the stored lipid reserves in Gyrodactylus (Monogenea) using confocal and transmission electron microscopy. J Microsc Ultrastruct 2016. [Doi: 10.1016/j.jmau. 2017.02.003]. Brooker AJ, Grano Maldonado MI, Irving S, Bron JE, Longshaw M, Shinn AP, et al. The effect of octopaminergic compounds on the behaviour and transmission of Gyrodactylus. Parasit Vectors 2011;4:207.